I am a novice(total newbie to computational complexity theory) and I have a question. Lets say we have 'Traveling Salesman Problem' ,will the following application of Dijkstra's Algorithms solve it? Every step we make the graph smaller while we move the next available shortest distance point. Until we visit all the points. Will this solve the traveling salesman problem. Dijkstra's algorithm returns a shortest path tree, containing the shortest path from a starting vertex to each other vertex, but not necessarily the shortest paths between the other vertices, or a shortest route that visits all the vertices. Starting from $a$, the greedy algorithm will choose the route $[a,b,c,d,a]$, but the shortest route starting and ending at $a$ is $[a,b,d,c,a]$. Since the TSP route is not allowed to repeat vertices, once the greedy algorithm chooses $a,b,c,d$, it is forced to take the longest edge $d,a$ to return to the starting city. As it already turned out in the other replies, your suggestion does not effectively solve the Travelling Salesman Problem, let me please indicate the best way known in the field of heuristic search (since I see Dijkstra's algorithm somewhat related to this field of Artificial Intelligence). A heuristic algorithm can return optimal solutions (though the sizes it can manage are relatively small as a matter of fact) and the following method was suggested by Richard Korf in the 90s. While it works perfectly for the symmetric travelling salesman problem (where the cost of the edge $(u,v)$ equals the cost of the same edge when traversed in the opposite direction $(v,u)$), it can be easily adapted to the alternative case of the asymmetric version. As a matter of fact, let me highlight that since this approach was suggested not much progress have been seen in the field for deriving optimal bounds of this problem so that I do consider it to be a hot question in the field of combinatorial search. I have no idea how anyone here didn't notice that the application of Dijkstra's algorithm would be entirely unnecessary in this case? 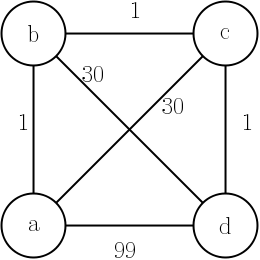 You could implement this greedy algorithm by simply selecting the closest node, which is known apriori. Dijkstra's algorithm is used for discovering paths, but you are only taking a single step each time. This obviously does not find the optimal solution to the TSP, but many very good approaches do not find it either. All optimal solution finders for TSP are very computationally demanding. using Dijsktra's algorithm, would make the poor salesman starting at point 0, first go to 1 then to 2 then to 3 ect. which is not the optimal. Hope that helps. Have a look at the first chapter in Steven S. Skiena excellent book called "The Algorithm Design" it explains this example in more detail. The TSP problem is not finding the shortest way between two points, but in making a route between all the points which are optimal. When you have the optimal route you can use Dijsktra to find the shortest path between each points in the route. Efficient algorithm to find minimum steps to cover all the given points in infinite 2D grid? What actually is Blocking flow problem? Will the Traveling Salesman Problem (TSP) become easier if the simple path constraint is omitted?